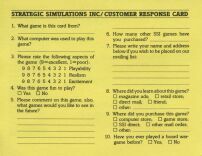 Without a doubt, Strategic Simulations Inc. (SSI) is the champion of RPG gaming, having some forty-odd games released in a period of about ten years!! (count 'em below if you like). Not only were they big in quantity, but in quality as well. Questron is a favorite among many, as was Phantasie and Shard of Spring. These and their various sequels and cousins whet many appetites for good fun role-playing. Each had a unique game system varying widely in how combat was carried out and how many characters adventured together (solo or party). Following this burst, in 1988, they obtained the license to produce the famous Gold Box series of TSR games. These nine RPGs were the only ones to use the D&D official game rules and had excellent graphics, gameplay and strategic overhead combat, as well as animated magic spells, and plenty of evil baddies to slay. Many games were based on actual D&D modules and/pr novels, or vice-versa. Unlimited Adventures was a sort of Gold Box Construction Set for making your own D&D games, and many are out on the 'net still that can be downloaded and played once you finish the nine official games. Another ground-breaking series was Eye of the Beholder. Contemporary with DungeonMaster by FTL, EOB was one of the first RPGs to combine multicharacter with a first-person view and the official D&D game rules. For the first time, monsters actually chased you down corridors, and fireballs exploded from your hands and blasted into foes. It was a new level of realism and was simply amazing for its time. Finally, a number of worthy games developed by Event Horizons were published by SSI. These were all very similar and were all solo RPGs, but had excellent plots and puzzles and were fun to play, perhaps the most famous being The Summoning.